Information about airlines and how to get to Telluride. 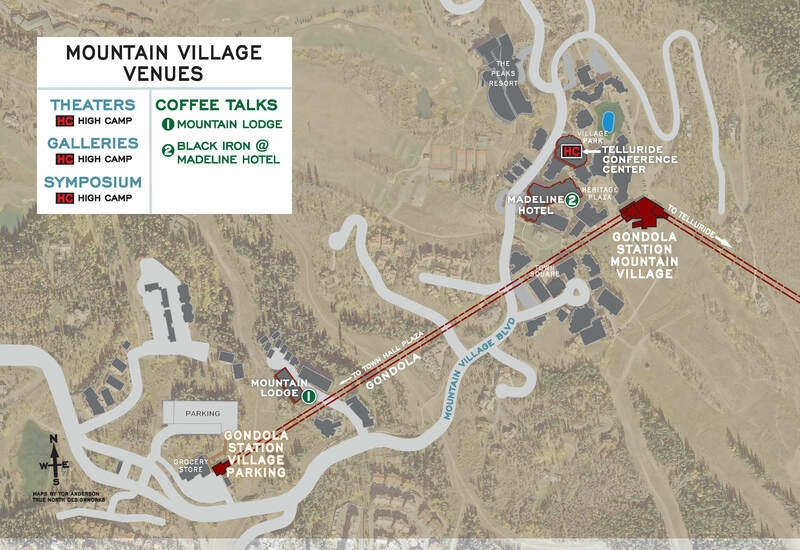 Gondola Hours, Airport Shuttles, taxi numbers and other information to help you get around Telluride & Mountain Village. Accommodation options abound in Telluride & Mountain Village. Check out these offerings. Once you arrive you'll need to visit Hospitality to get your pass and festival program. If it's your first time to Mountainfilm, you'll want to review how our passes work and how you can maximize your time at Mountainfilm. Stay up to date during the festival with Mountainfilm's mobile app. We try our best to stick to the schedule, but sometimes things change. The best way to understand our annual festival is to browse the festival program — available online and from Hospitality. At 8750 feet, visitors to Telluride can sometimes experience some altitude sickness. We've assembled some tips to help you avoid the risk of AMS. We've put together some information regarding babysitting, nanny services, gear rentals, child care and programming for children. Maps of the town of Telluride and Mountain Village with festival venues highlighted. Flights are available to Telluride (TEX) or nearby Montrose (MTJ: 68 miles), Durango (DRO: 124 miles), Cortez (CEZ: 80 miles) and Grand Junction (GJT: 133 miles). International airports in Denver, Salt Lake City and Albuquerque are a scenic six- to seven-hour drive away. Bustang Outrider operates one round trip daily between Durango and Grand Junction over Lizard Head Pass with stops in Mancos, Cortez, Dolores, Rico, Telluride, Placerville, Ridgway, Montrose, and Delta. For more information about the route, schedule and fares visit their website or call (970) 563-4545. Contact KOTO: 970-728-4333 or 970-728-4334. All theaters are reachable by foot, bicycle or the gondola — which runs between Telluride and Mountain Village from 6:30 a.m. to midnight. On Friday and Saturday during the festival, gondola hours are extended until 1 a.m. Telluride’s shuttle bus, the Galloping Goose, runs a loop through Telluride every 20 minutes. In Mountain Village, dial 970-728-8888 during gondola hours for Dial-A-Ride services within Mountain Village. Loaner bikes are available at the Wilkinson Public Library. All of these transportation options are free of charge. The Galloping Goose offers point to point para (ADA) transit service privately upon request by calling (970) 729-0045 or every 20 minutes on the regular fixed route. If you're looking for a place to stay in Telluride or Mountain Village, please check out our Lodging Sponsors who graciously support our organization and offer special discounts for Mountainfilm attendees. There are also lots of camping opportunities in and around Telluride, but prepare for spring mountain weather. For information on camping in Telluride Town Park, visit the Town of Telluride website. The friendly, experienced team at Exceptional Stays is on hand to help you plan the perfect Mountainfilm weekend! The team consists of the most knowledgeable and attentive staff in the vacation rental industry today. Exceptional Stays ultimate goal is to create the most luxurious, fun and relaxing festival experience for you and your family, with memories to last a lifetime! The Peaks Resort & Spa, located in Telluride's Mountain Village offers luxury hotel and residential vacation accommodations. Enjoy world-class outdoor adventure, unparalleled views and amenities with a dedicated staff committed to providing genuine care for our guests. Enjoy 10% off by calling (855) 860-4252 or booking through the link below. Camel's Garden Hotel, ideally situated on the San Miguel River only two blocks from Main Street, offers the highest level of comfort and personal service. Heart of Telluride's rental units are ideal if you are looking for a comfortable, high-end downtown Telluride, Colorado home. 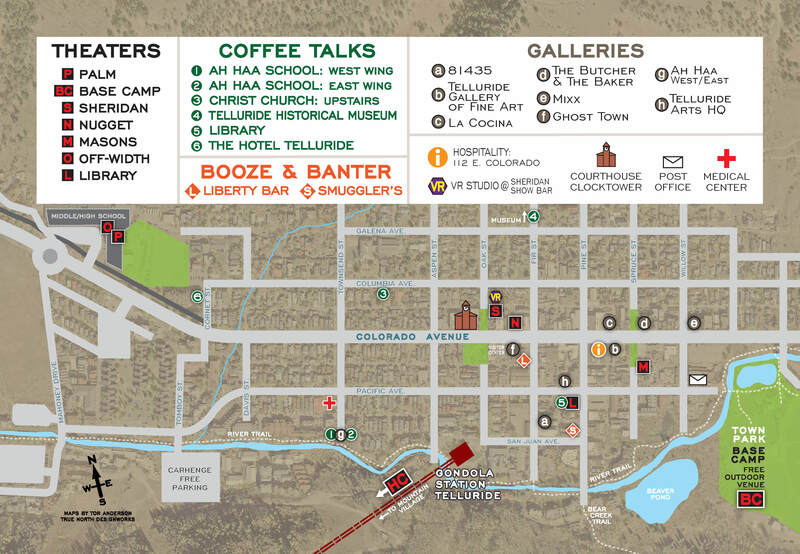 The Hotel Telluride is located in historic downtown Telluride, walking distance of all of the Mountainfilm theaters and also proud to be a sponsor and location for Mountainfilm's Coffee Talks. For those moments where you are in a hurry or need a lift, they also offer a complimentary shuttle to all guests within the town of Telluride. Accommodations in Telluride offers clean, well-stocked superb properties, but the real vacation starts with your desire to have an extraordinary experience. Our T.L.C. (Telluride Local Concierge) team will provide all the information, experiences and services you need to make your Mountainfilm weekend a lasting memory. Be at home, on the mountain, and escape to leisure and adventure amid the magnificent San Juan Mountains in Telluride. Fairmont Heritage Place, Franz Klammer Lodge, ideally located in Mountain Village, provides luxury living in the heart of one of the world's most sought-after destinations. Once you arrive, pick up your pass and a program at Mountainfilm Hospitality, which is located at 112 E. Colorado Ave. There, you can orient yourself and start planning your festival. Thursday, May 23: 9 a.m. – 8 p.m.
Friday, May 24: 8 a.m. – 9 p.m.
Saturday, May 25: 8 a.m. – 7 p.m.
Sunday, May 26: 9 a.m. – 7 p.m.
Monday, May 27: 9 a.m. – 12 p.m.
All theaters have two lines: 1) passholders and ticket holders and 2) ticket buyers. Pass and ticket holders are admitted first; additional tickets are sold if seats are still available ($25). Queue early, especially at the smaller theaters: Sheridan (230 seats), Nugget (165), Masons (145), The Off-Width (120) and The Library (65). The back of your pass lists restrictions. Individual program tickets ($25) go on sale after all passholders have been admitted to the theater. Credit cards only, no cash. Q cards are distributed to passholders by the Q Team one hour before each program. The Q Team is the ones in the red vests so they are easy to spot. You must be in line with your Q no later than 30 minutes before the program starts to ensure that you are present when staff begins to load the theater. If you aren’t in line when your Q number is called, you’ll have to wait until the entire line is let in. Embrace the Q! It’s an opportunity to mix it up with filmmakers and fellow festival-goers. Check out Hot Seats on Mountainfilm’s app or website for theater availability. If you are a Patron passholder, arrive at the theater no later than 20 minutes before showtime to gain priority entry. And to ensure that our audience gets the best out of its line time, we’ve gathered a cadre of musicians and entertainers — our roving Q buskers — to play, perform and keep things lively. For the uninterrupted enjoyment of all, theater staff will not grant access to a program once it starts. TBAs and special screenings will be posted at 8 p.m. on Saturday and Sunday outside all theaters, on the mobile app, at Hospitality, on our Facebook page and Tweeted by @mountainfilm. Stay up to date during the festival with Mountainfilm's mobile app. Keep all of the program information — films, presentations, events and more — at your fingertips. Opt-in to notifications and receive alerts about schedule changes, TBAs and general festival updates. You can choose which notifications you would like to receive and if you hate notifications, you can find all of this information in the News & Social tab. When you launch the app, you will see a list of feature films on the home screen. To see a full lineup of films, presentations, events, town talks, parties and more, visit the Lineup tab in the Festival Schedule section. You can easily filter events in the Lineup tab in the Festival Schedule section. Tap "Filter" in the top, right corner and select the type of event you would like to see! Remember to deselect events to return to the full lineup list. This feature allows you to create your own schedule within the app. Just tap Add to Schedule in any block and it will appear in the My Schedule tab. You can even set alerts to remind you of upcoming events. The What's Hot section shows you what other app users are enjoying. You can "like" an event by tapping the thumbs up in any block. Mountainfilm is dedicated to educating and inspiring audiences, but another motivation underlies our mission: We want to help promote action toward positive change. The Take Action tab connects you with all of organizations and causes connected with the festival giving you the power to act when you are feeling inspired. You can vote for the Audience Choice Award through the app. Make sure you have your pass handy to enter your unique voting code. Votes must be in by 1:45 p.m. on Monday, May 27. We want every festival to be better than the last. You can complete our festival survey for a chance to win a Palmyra pass to the 2020 festival in the app. We’ll announce the winner on June 17, 2019. Download the app below or by searching Mountainfilm in the app store for iOS and Android devices. We try our best to stick to the schedule, but sometimes things change. Stay up to date on the latest festival announcements via our website, app and social networks. You can find the latest schedule changes and TBA announcements on our app. Be sure to opt into notifications or visit the News & Social tab. Schedule changes and TBA will also be available on our Festival Updates page. TBAs and schedules changes will be announced on Facebook, Instagram and Twitter. Be sure to follow @mountainfilm. TBAs and special screenings will be posted at 8 p.m. on Saturday and Sunday outside all theaters, on the mobile app, at Hospitality, on our Facebook page, Instagram stories and Tweeted by @mountainfilm. No pass, no problem! Amid the talks, walks, films and presentations, there are many free events — so many that you could string together an entire itinerary without purchasing a pass, getting your yearly dose of inspiration, even if you don’t have a lanyard. Mountainfilm’s production team transforms the Telluride Town Park stage into a state-of-the-art outdoor theater called Base Camp. For five nights beginning Wednesday, May 22, Mountainfilm beams films from this impressive screen under the stars to audiences who tote low-backed chairs, blankets and warm layers to the park for a special movie experience. Films begin at 8:45 p.m. nightly. For candid conversations between big-name and fascinating guests, check out Coffee & Conversation and their afternoon counterparts, Booze & Banter. These free events take place from 8 to 9 a.m. Saturday through Monday (Coffee), and 5:30 to 6:30 p.m. Friday through Sunday (Booze) at venues across town. The gatherings are ground zero for some of the meatiest and most interesting conversations at the festival. The coffee is free, but don’t forget to bring your own cup! Mountainfilm has a history of getting people outside, and to honor that tradition we offer Free-Range Programs — events centered around the mountains, forests, trails and history of Telluride. Check the schedule for a list of programs, locations and times. Rain or shine! Mountainfilm celebrates the two-dimensional work of its photographers, activists and artists with the Gallery Walk, which fills galleries and venues downtown with bold, beautiful and change-making work. Artists are on hand to speak about their exhibits, and the work remains on display throughout the weekend. The opening reception is Friday from 3:30 to 6:30 p.m.
Mountainfilm’s Sunday afternoon Reading Frenzy is a bookworm’s dream. The event, organized by Telluride’s bookstore Between the Covers, brings festival authors to the Ah Haa to sign and sell their books. It runs from 2-4 p.m.
Because who doesn’t like free ice cream? The social, which takes place Saturday afternoon on Colorado Avenue, between Aspen and Fir streets, is part street dance, part farmers market and part outdoor gathering to learn about action initiatives and chat about the films, art and ideas that have most blown your mind. It takes place from 2 to 3:30 p.m. Individual program tickets go on sale if there are still seats available after all passholders have been admitted to the theater. Tickets are $25. Credit cards only, no cash. Perhaps the best way to understand the annual festival — short of actually attending — is to look through past programs. Each contains information about that year's films, special guests, social events, art exhibits and the Moving Mountains Symposium that explores a different issue every year. Programs from the past several years are available to view and download below. Listed beside each year is the theme of its respective symposium. The latest festival program is also available on your smartphone: Download the Mountainfilm mobile app to see the most up-to-date festival information. Ascend slowly: Schedule an overnight stay at an intermediate altitude on the way to Telluride, such as Denver, Durango, Ouray, Ridgway or Placerville. Stay hydrated: Drink an extra liter of water daily. Avoid alcohol and anxiety/sleeping medications in the benzodiazepine family (Xanax, Valium, Ativan, Restoril, Serax and others) — alcohol and benzodiazepine medications suppress breathing and result in lower blood oxygen. Avoid overexertion during the first day or two at altitude. If any symptoms are severe or do not subside within 48 hours, call 911. For more information about altitude and your health, visit the Telluride Institute for Altitude Medicine or the Telluride Medical Center at 500 W Pacific Ave. It's easy to enjoy Mountainfilm as a family. Most of the parties are kid-friendly midday events, such as the Ice Cream Social and Closing Picnic. Younger kids can attend the Kidz Kino program, a show geared toward children ages 6 to 12. Older children will enjoy and learn from most of the regular festival programs. Documentaries are not given ratings, but much of Mountainfilm content would garner a PG or PG-13 rating. Pay special attention to film descriptions; some films delve deeply into challenging content — such as war, slavery, or poverty — and the description will help you make a decision based on your child. We offer a heavily discounted student pass, which gives current K-12 students the same access to festival theaters as a Fitzroy. Telluride also offers licensed babysitters, gear rentals and nanny services for parents. Telluride Sitters offers child care services for residents and visitors. The staff includes professionals who are over 21 and CPR/First Aid certified. Babysitters come to you, so there's no need to worry about transportation — even for equipment and toy rentals, which they set up for you upon delivery. Telluride Sitters is a licensed, insured and bonded company that is locally owned and operated in Telluride. Annie's Nannies provides experienced nannies selected to fit each family's needs and budget. Nannies are available on an hourly, daily or weekly basis. Annie’s Nannies specializes in creative play, outdoor adventure, hands-on learning, art and more. Visitors and locals enjoy childcare at their homes, accommodations and around Telluride. Additional services include infant specialists, adventure guides and pet sitting. Traveling Lite provides baby and children equipment rentals.! Providing full-size cribs, highchairs, toys, strollers and more. Coordinating with you or your property management to deliver, setup and pick up. Specializing in children’s equipment rentals in Telluride since 1996.